As you can tell, this month’s featured ingredient is CHERRIES so I made these Sweet Cherry Rolls with Almond Cream Cheese Glaze. Be still my beating, cherry heart! THIS is the exact reason why I love participating in the #TwelveLoaves challenge each and every month. I love the creativity it provides me, I love the exciting challenge it gives me to come up with something new and yummy, and I love seeing what the other #TwelveLoaves bakers come up with their creative recipes that features the ingredient of the month. While I was planning this recipe, I knew I’d need to find an easy way to take the pits out of the fresh cherries I’d just purchased. I looked at the store for a cherry pitter while I was there but was unable to find one. When I asked the question on facebook, “What common household item can I use for removing pits from cherries?” my friend Jenni Field, of Pastry Chef Online came to my rescue with something she’d seen recently from her friend Marc, of No Recipes about using a paper clip to remove the pesky pits. Let me tell you, it worked like a charm! You can watch his video here of how it’s done, and I’m sure you’ll be as amazed as I was! You’re going to love the flavor of these awesome sweet rolls. The remind me so much of the danish we sold at the corner bakery where I used to work years and years ago… only better. 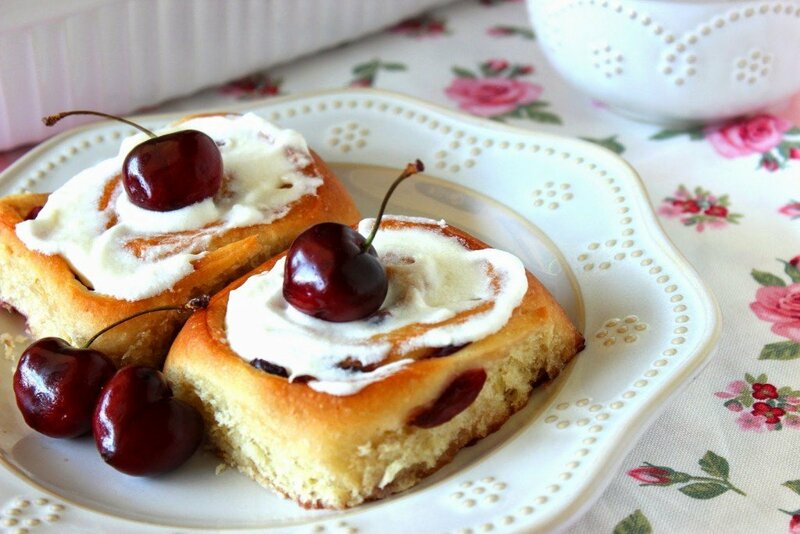 The fresh cherries gives these rolls a slight tartness that compliments their seasonal sweetness. The almond cream cheese glaze is the perfect compliment to top them off as it’s sweet but not overly sweet. In my mind, these are the perfect breakfast sweet roll, and they’re a great way to start any day off with a smile! -In the bowl of a stand mixer using the dough hook, or a large bowl with a wooden spoon, mix all the dough ingredients until the dough comes together into a smooth, elastic ball. *Note -this should take approximately 7 minutes on medium speed if using a stand mixer, and longer if kneading by hand. -Turn the dough out onto a lightly floured surface and knead by hand for an additional few minutes. -Place the dough into an oiled bowl, cover with plastic wrap and allow to rise in a warm draft free place until doubled (about 1 1/2 to 2 hours). -While the dough is rising, stir together the cherries, sugar and almond extract. Refrigerate until ready to use. -After the dough had doubled in size, punch down to deflate and turn it out onto a lightly floured surface. -Using a rolling pin, roll the dough out into an approximate 10″x 14″ rectangle. -Using an offset spatula, spread the softened butter evenly over the dough. 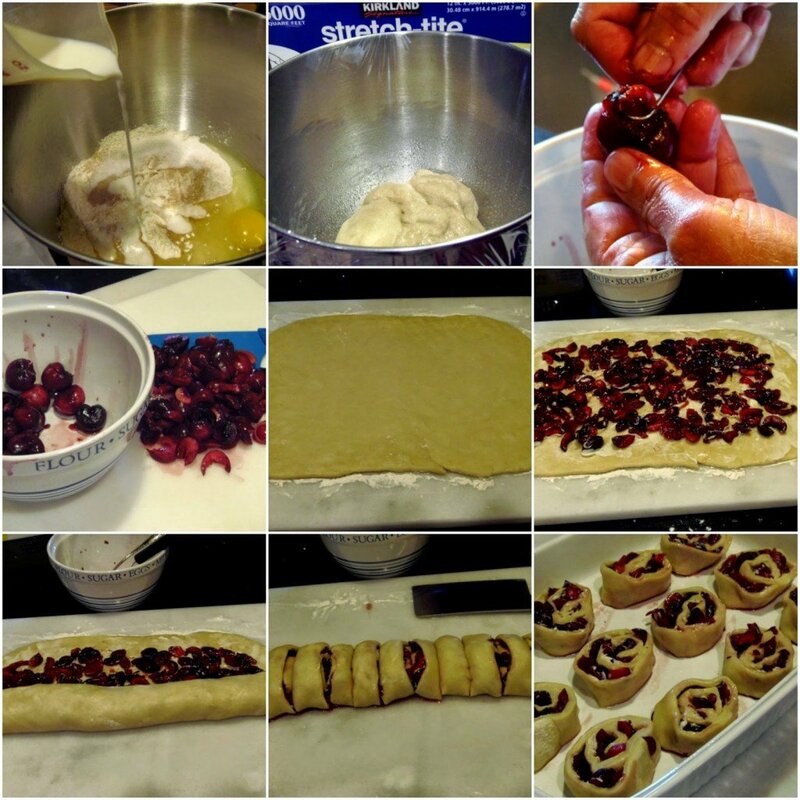 -Drain the cherries and spread them evenly over the buttered dough. -Roll the dough, starting with the long side, to form a tight’ish cylinder. -Slice both ends of the cylinder off to form even ends. Discard the ends. -Slice the cylinder of dough into 12 equal size portions. -Place the cut dough into a greased 9″ x 13″ baking pan *Note – You may need to reform them slightly with your hands after they’ve been sliced so they resemble their original circular shape. -Place the baking pan into the preheated oven and bake for 30-35 minutes. -To make the glaze, cream together all the ingredients with a hand mixer until it is light and fluffy with no lumps. 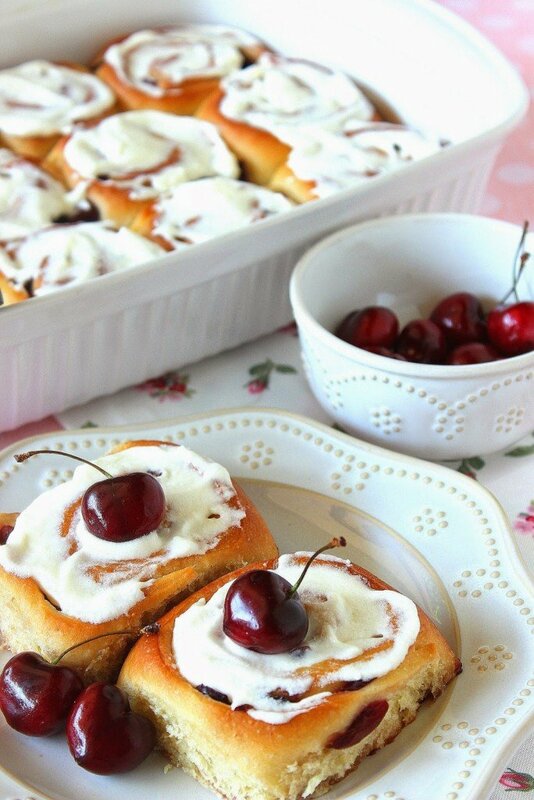 -Spread the glaze on top of the sweet cherry rolls and serve. For more wonderful cherry bread recipes, please click on the links below from the other #TwelveLoaves bakers. I promise, you won’t be sorry! 3. Have your Twelve Loaves bread that you baked this June, 2014, and posted on your blog by June 30, 2014. #TwelveLoaves is a monthly bread baking party created by Lora from Cake Duchess. Your sweet rolls turned out so nice. And put cream cheese glaze on any sweet roll and I'm running to the pan to grab one right then and there. Yum! Gorgeous rolls, Renee! I've heard of the paper clip method before, but never tried it (I kid you not, I own 6 cherry pitters – obsess much), it looks brilliant! Simply amazing rolls! I love Jenni too. She always has fabulous ideas. I should have used her method–lol–but I used my hands and knife instead. Took forever! LOL Enjoy your day. My goodness, these sound so wonderful!! Oh goodness, what's not to love here? Love cherries so much. GIMME. Mmm cherries! These look perfect! And would make a wonderful Sunday brunch! The paperclip idea is awesome but let's talk about those rolls. Those gorgeous rolls! I must try that recipe. They look so beautiful, frosted with a fresh cherry on top. I'm saving this for later. My husband loves cherries!! He will love this! 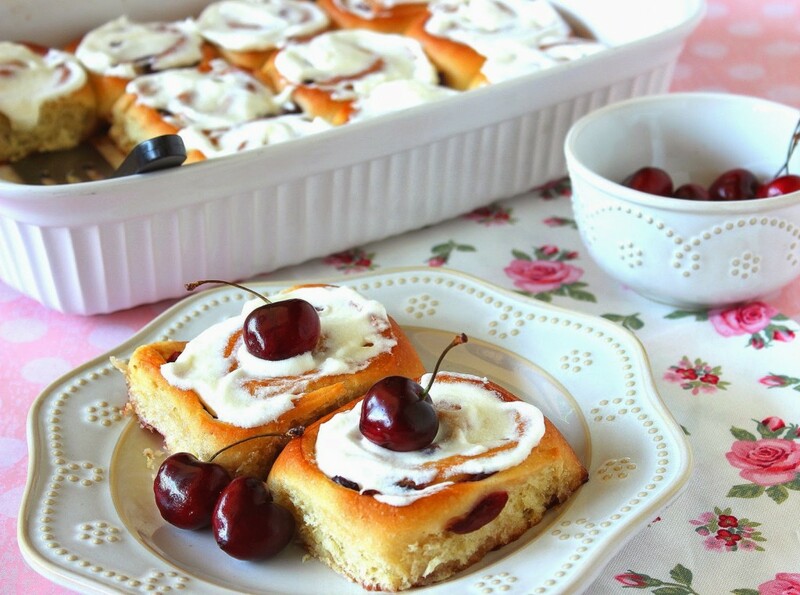 Sweet Cherry rolls with almond cream cheese glaze?!! YES!! LOVE these. . wish I could have 3! My family would go CRAZY for these!! YUM! What a lovely twist to the breakfast rolls, Renee. In fact I would have them all day long but not at home cause' my son is allergic to almonds. Just beautiful! this is the second cherry recipe i have seen today, and i am in love! Your breakfast rolls are amazing. What a great challenge too…I'm loving all the wonderful recipes using cherries. Your breakfast rolls looks delicious. I'm loving all the creative recipes with cherries! Absolutely wonderful especially with the cherries! These not only look gorgeous I bet they taste out of this world! Trust story, I'm so scared of baking with yeast I almost never do it. I really need to get over that asap so I can make these rolls! Metabolism is really wasted on the young. I would love a calorie free day just to eat a whole pan of these! I love the use of cherries here! I clicked on your link and as I scrolled down, I actually spoke out loud. "Ooooh, pretty!" I was on my own in the room so I couldn't even pretend to be talking to the dog. But, you know what? I am willing to take on the label crazy to talk to your cherry rolls, Reneé! They look wonderful! Yum Renee! So gorgeous and amazing photography! These look great! Thanks for the step by step photos– the only thing missing is a photo of me eating one of these right now, wishing I had this for breakfast today! Who needs a cherry picker when you have paperclips! Great tip for removing the pits and your rolls looks wonderful! You had me at cherry, but the almond cream cheese frosting seals the deal. Your photos are a great resource for a novice like me – thanks! I just wasted 3 hours on this recipe. I'm guessing the egg in the first picture should have been included in the dough ingredients? Dear Anonymous! I am so sorry, and you're right, in my haste I forgot to add the egg into the ingredient list and instructions. While I do try my hardest to write my recipes without error, sometimes mistakes happen and they get past me. Sadly I have no editor so there are times when I'm working on a deadline, mistakes don't always get caught. I wish there was some way for me to give you your 3 hours back, or better yet, if I could go back in time to have written the recipe without error…I would. Unfortunately, I can't. Please know that I do feel awful about this and will try my hardest never to let such a mistake happen again. Thank you for letting me know. I appreciate it.